Mary Gonzalez strolls the streets of Chicago’s meatpacking district every evening, keeping a watchful eye over “her” neighborhood kids. Tony Ortiz encourages young men in California state prisons to break free of the brutal gang life he once knew all too well. Joe Hynes, Brooklyn’s district attorney, champions women and children, not wanting them to suffer as he suffered. They, and the twenty-one other amazing people interviewed by Jack Calhoun, are reshaping lives and communities across America. They include Christians of every denomination, Muslims, Jews, and others, some who pray five times a day and some who are, frankly, “not that religious.” They are people of enormous enthusiasm and iron resolve, each with a great capacity for compassion and an extra helping of common sense. And their tireless efforts benefit us all. But as each tells Calhoun, there’s much more to the story. You may have heard of some of these Americans. Several are in the news. The good works of all shine brightly in their communities. What you haven’t heard about is the underlying force, the hidden source of their seemingly endless energy and selflessness. It is faith—a deep and, in some cases, unsuspected spirituality. They have the unshakeable sense that they work not only for their organizations—and each individual they encounter—but especially for God. Calhoun reveals how people across the nation sustain their tremendous dedication in the public sector by privately calling upon their deeply-held beliefs. Calhoun was once an eager divinity school student, hungry to make a difference. Through the years he rose to national prominence in the field of public policy, serving as US Commissioner of the Administration of Children, Youth and Families and later spending twenty-plus years as the founding president of the National Crime Prevention Council. However, something wasn’t right. Caught up in a parade of committee meetings, speaking engagements, and policy and program initiatives, he had lost touch with the bedrock of his vocation. It took an encounter with an unusually clear-sighted volunteer to reconnect his daily work to his faith in God. Reinvigorated, Calhoun embarked on a two-year cross-country quest to find out how faith motivates some of America’s hardest-working public servants. The people he spoke to pursue a range of innovative and ambitious plans to help their communities, and their accomplishments are impressive. But just try telling them so. They have been chosen, they’ll explain, to fulfill a larger purpose. Their paths have been rocky, their burdens heavy, and the work hasn’t always been fun. Yet they feel blessed, emboldened by their trust in a higher power to live lives of acceptance and unbounded love. Some recent books have laid divisiveness and hostility at faith’s door. Hope Matters brings to light the togetherness and reconciliation that faith truly engenders when good people heed its call to action. You won’t hear Mary, Tony, Joe, or the rest preaching from the pulpit, or even in the streets. They have no sermon or script to follow. Theirs is a ministry of open arms and second chances, of waking up each morning with new challenges and going to bed each night with renewed faith. Their stories just might inspire you to make your own “place of worship” a little bigger. 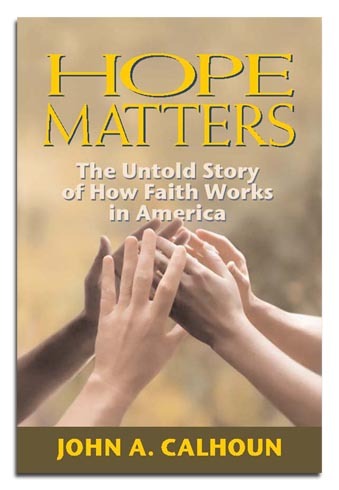 For more information about author John Calhoun and Hope Matters, visit hopematters.org.